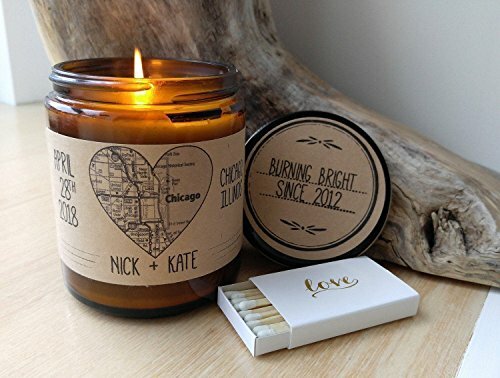 Personalized Wedding Candle Hand Poured Soy Candle available in 2 size options. ANY CITY SKYLINE AVAILABLE WORLDWIDE! Completely Handmade in Astoria, Oregon. We also offer an upgraded gift box option too! HEART MAP GIFT BOX UPGRADE INCLUDES: 1. Your Custom "Map Heart" Hand Poured Soy Candle. (2 Size Options Available) Completely personalized with your custom message on the candle lid! 2. A "LOVE" Matchbox Set. 3. An "I Love Us" Ceramic Coffee Mug. 4. Gold Foil "All In" P Laying Cards 5. Mr Heart Mrs Lumbar Pillow Cover. (12"x 20" Pillow Cover) 6. Congratulations Card. 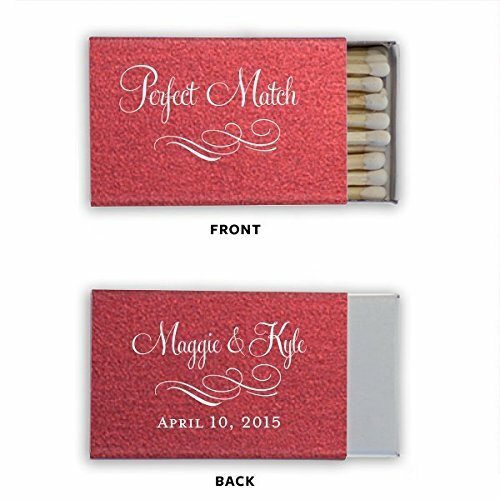 Our The Perfect Match matchboxes are the perfect little wedding favor for your guests. 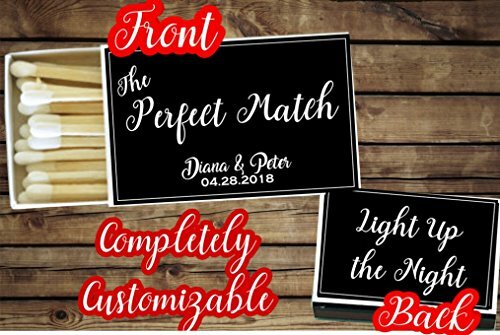 The matches are beautifully foil stamped, double sided and can be personalized with the bride and groom's names, wedding date and location. 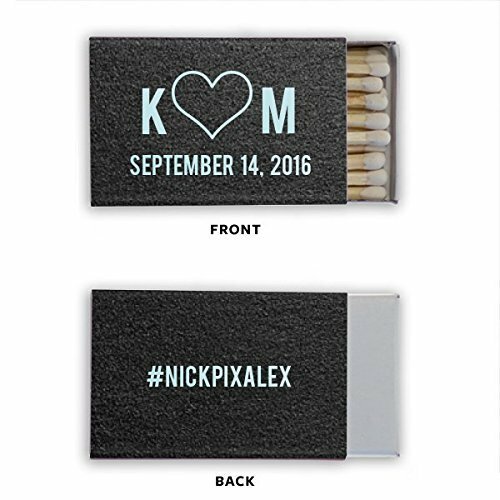 Customize your matchboxes to your own wedding colors and add them to sparklers to create the perfect personalized wedding favors! 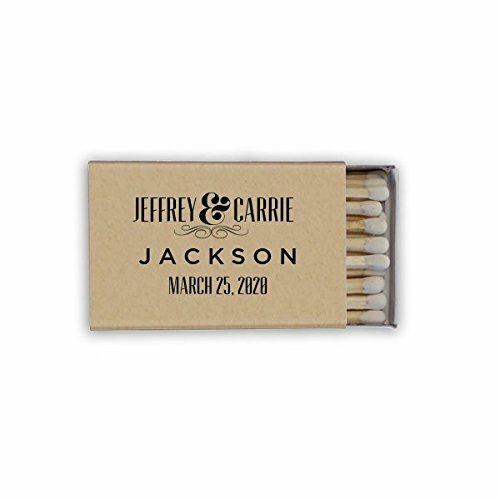 Our matches are also great party favors for any anniversary, rehearsal dinner, engagement party or bridal shower. Colors used in photo: Stardust Rose Gold matchbox and Brushed Gold foil. 1 Digital proof is included with your order. Additional proofs are available for purchase. 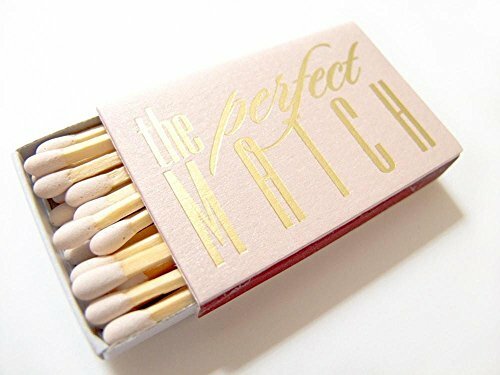 ❤ Minimum order is 50 matchboxes of the same colors and style. Feel free to e-mail me if you need quantities not listed. 1 digital proof is included and your proof will be e-mailed to you within 2 business days after your purchase. 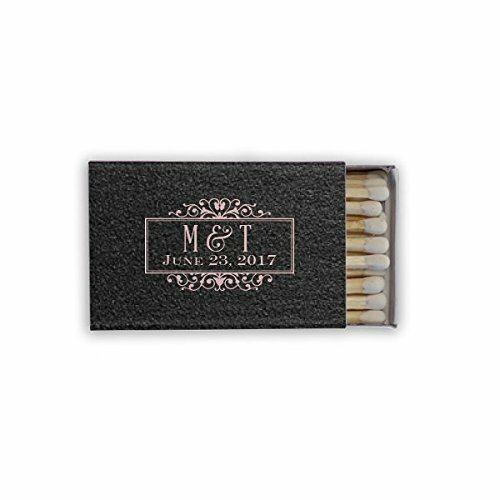 Once you approve the proof your matchbooks will be sent to print. Any changes made to the wording, fonts, layout, placement and or design of this item will incur an additional design fee. E-mail me for more info. Color: View the color charts in the photos to view all the matchbox and foil color options. Spark Candles Mini Essentials Collection is the perfect daily indulgence and make excellent wedding and party gifts. Treat your guests to the finest blend of soy wax and essential oils. Each begins with wax from 100% pure soybeans, farmed without pesticides and GMO-free. Our essential oils are imported from around the world, extracted from flowers, barks, leaves and fruits, then carefully blended by hand for the best artisan scents that will bring balance to any room. Each gift set includes 3 minis + matchbox. 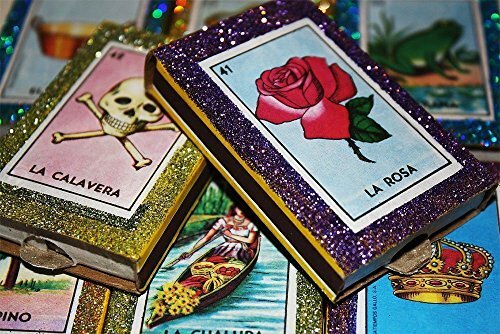 Loteria matchbox wedding favors surrounded by vibrant micro glitter. Give to each of your guests, use as party decorations or your cigar bar. You can fill them with candy, gum, or any other tiny gift. Each matchbox is 1 3/4 inches wide, 2 5/8 inch long and 1/2 inch thick. This is 50 favors.